I’m a huge fan of the Laverda twins and triples. They’re weird, tough, handsome, and rare. And usually very, very orange. But not this one. Laverdas have an enviable reputation for durability and reliability. Very few shops specialize in them, but the community is well known for a do-it-yourself mentality: the bikes are overbuilt and fairly simple to work on. The biggest problem is finding one, but luckily, I’m here to help: see the original eBay listing. The Laverda 3C was the three cylinder follow up to Laverda’s 750 SF twins. 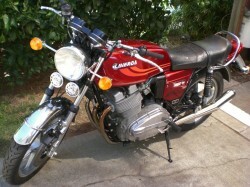 Introduced in 1973, the bike displaced 981cc’s, made about 80hp and ran to 130mph. 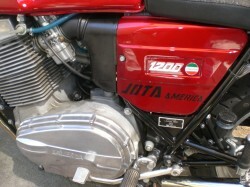 Named for a Spanish dance, the Jota was basically a hot-rod version of the 3C developed in by Slater Laverda in England and introduced in 1976. The original bikes used a 180 degree crank, with pistons oriented “one up, two down”. In 1982, the motor was given a 120 degree crank and the bike had a much smoother character as a result, but lost some of its hard edge. The 1200cc was an evolution of the bike that moved even further away from its wild and wooly roots, but made it a better daily ride. A helpful clip of the bike running and riding by. Engine: Found to have high, even compression– did not even go inside. Runs strong. Engine was not removed during restoration, frame paint was shiny original. Fresh oil of course. Miles are original. I’d suggest checking timing chain and valve tolerances before extended riding. Body/Frame: Fresh candy red paint over small gold metalflake, clearcoat. 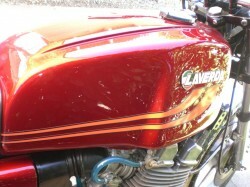 Fantastic finish– color was matched from the original paint on the bike. NOS stripes on top of clearcoat. New sidecover badges, restored tank badges. I had to get the Jota America decals made, as they were not available. Seat is the original cover, has a tear pointed to; I could not justify replacing an original cover for that. Fenders are clean and straight. New Jota handlebars on 1″ risers. Magura grips. It has a conversion kit for a japanese sidestand. The oem stand was crap. This kit required the cutting of the centerstand foot nub; worth it to get a good sidestand. New grab rail. Gorgeous bike. Transmission: Shifts great. It’s on the right, brake’s on the left. I installed the longer clutch engagement arm for a real difference in ease of clutch pull. New clutch cable. Sprockets and chain cleaned and lubed, in super condition. Carbs: Rebuilt with complete kits. New throttle cable. New fuel lines. New filter and airbox. 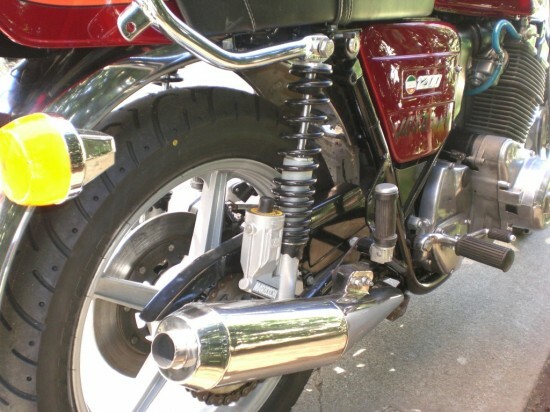 Exhaust: New stainless steel pipes and mufflers. Collector box very solid, just painted it. 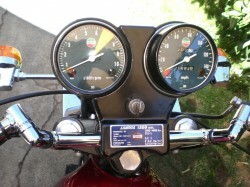 Gauges, Controls: Both gauges work perfectly. New Venhill cables. Brakes: Rebuilt front and rear master cylinders. Original Brembo rotors are thick and true. Rebuilt rear caliper. Front calipers are more modern 4 piston calipers taken off a running K1200LT– why not? Pads are all good. Custom stainless steel brakelines, all three lines, with stainless steel fittings. Suspension: Cerriani forks have new seals and fluid- straight and clean. Rear piggyback Marzocchi shocks work as lovely as they look. Wheels: I did not even paint the wheels, the finish was fine. Greased the hubs, new tubes and Kenda tires. Sourced a replacement speedo drive. Electrical: Has the later, better coils. Strong spark, new plugs. Has a BMW gel battery, older, but they last a while. Has a battery tender terminal. New reproduction turn signals, new stems. New Voxbell horns- best sounding horn, to my ears. All lights and switches work as they should. 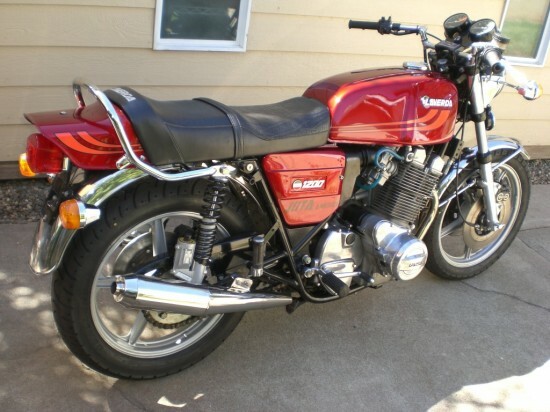 Honestly, I prefer my Laverdas bright orange, but this candy apple red on this bike is very vivid and evocative. It’s a gorgeous bike in impressive shape, although that price makes one pause, considering it’s not one of the early, ferocious 1000cc bikes. As rarely as Laverda triples come along, this one is worth a serious look.